Here is the third and final part of my series of posts on how Irish design and exhibitions have presented Irish identity, with Parts #1 and #2 available for you to read back on. This final part looks at recent and current international exhibitions of Irish design to see how they continue in a particular tradition of... well... tradition. Read on! In the past 15 years there has been a marked increase in the promotion and dissemination of design in Ireland and Irish design abroad, culminating (for now) in Irish Design 2015 (ID2015), a year of events in Ireland and internationally led by the Design and Crafts Council of Ireland (DCCoI). Prior to this, the founding of the Irish Architecture Foundation in 2005, Dublin's shortlisted bid in 2011 to become World Design Capital and an increase in independent design retailers in Dublin, around Ireland and online have begun to place design within the public consciousness in Ireland to a much greater extent than before. 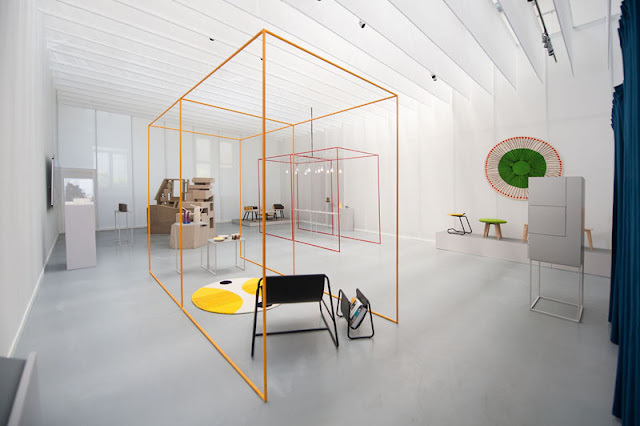 Ireland has participated in every edition of the Venice Architecture Biennale since 2000, is creating more and more prominent displays at international trade shows and is increasingly exhibiting contemporary design and architecture at home too. With an increase in presenting and disseminating Irish design and architecture, there is more scope for a multiplicity of stories told about it. And while stories of urbanity, of applications of technology and cutting edge engineering are indeed told through exhibitions of Irish design and architecture, the image of the rural is still being shown. This thread of balancing the traditional and the contemporary and indeed the image of the rural is continued most prominently in the exhibitions delivered by the DCCoI at the past three editions of London Design Festival. In A Place to Gather in 2012, Vernacular in 2013 and Weathering in 2014 we can see how masterfully Irish designers and craftspeople combine traditional skills and processes with contemporary needs or desires, yet again this work is framed in the rural to varying degrees. While A Place to Gather used its curation and exhibition design to create a welcoming space quite domestic in nature, and suggested a degree of urbanity in some of the objects on show and in its choice of venue (a disused garage in East London) it nevertheless let the Irish rural landscape in, particularly in the five minute promotional video accompanying the show, which captured scenes of rolling green hills, awe-inspiring cliffs, farm buildings and livestock. The following year, the rural framed the exhibits included in Vernacular quite literally. 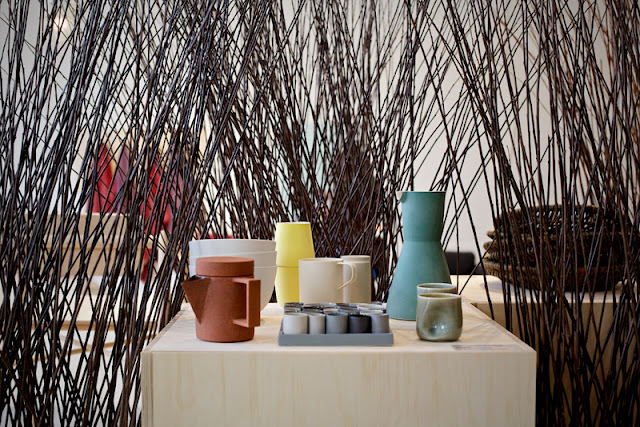 In a space of its own at Tent London in the Truman Brewery, all of the exhibition's plinths were wrapped in reeds, the material used in traditional basket making (pictured above). While some of the exhibits were contemporary in nature or created by designers or architects, not traditional craftspeople, they were nevertheless viewed against (or obscured by) a representation of the countryside, of traditional processes, of the rural image. Just as the international exhibitions and in-store events of the 19th and 20th centuries recreated a rural atmosphere through demonstrations and performances, the rural has been performed at these exhibitions too. Weathering featured demonstrations by basketmaker Joe Hogan within the exhibition space over the course of the Festival, while the opening event of Vernacular featured the reading of a short story set in a small Irish town by author Kevin Barry, complete with aimless youths killing time in the local pub, to the disgust of the local farmer. For attendees these things may provide a welcome change from the rest of LDF; a change of pace or merely a respite from passive consumption of product after product after product. And I will admit that traditional basket-making is fascinating, Joe Hogan one of the leading experts at it in the country, and literature is a massively important aspect of Irish culture. But for Ireland's only representation at the London Design Festival to come back to the rural time and again shows a one-sided view of a multi-faceted country. While not the only image presented of Ireland in exhibitions since the 1800s until now, the image of the rural has certainly persisted. And while it is not a false or objectionable image to present of Europe's westernmost nation, one which was late to industrialise, whose urban development has not reached the levels of some of its neighbours and who relies heavily on agriculture even still, it is an image which limits people's perception of Ireland and tells only a partial story of the country and its design. That said, it is an image which sells, and though design is not solely a commercial endeavour, design in Ireland has always been closely linked to trade and export and to the efficacy of campaigns for its highly successful tourism industry. The image persists today, with just one example being the current Irish pavilion at Expo Milano 2015, which brings to life 'the spirit of Ireland', showing the country to be 'rich in natural resources and green pastures that are pure, fertile and productive'. Certainly, the national exhibitions and international exhibitions hosted in Ireland in the 19th and early 20th centuries presented modernity, progression and technological developments in favour of this image of rurality. While I haven't delved into it (yet), there could be further evidence to suggest that historically the image of Ireland presented to the Irish is more progressive than that presented to our neighbours. The difference in representation internally and externally begs the question that regardless of how we might (wish to) see ourselves, is this persistent image of the rural what others want to see of us? And whose perception is more important? With ID2015 providing so many different opportunities to tell stories of Irish design both at home and abroad, I am happy to say that these opportunities for alternative narratives are being taken. Recently on show at Fuorisalone in Milan and touring to New York, Dublin and Eindhoven this year is Liminal, an exhibition showing a broad range of Irish design, focussing in particular on collaborative projects that lead to new, innovative, fun and functional products for the home, for work, to sit on, to eat and more (pictured above). As one of the designers involved, Scott Burnett, says, 'People who view it may not know much about Ireland, or they may have a “diddley-eye”, more folk-based perception of what Irish design is, so we wanted to create an honest collection that shows modern Ireland as it is'. As the ID2015 programme unfolds around the world, we could potentially see a host of different – and new – narratives about Irish design, craft and architecture, reflecting more wholly and more honestly the wide variety of work going on in Ireland's creative sector and its myriad influences and aspirations. Whether these narratives will sell as well as that of the rural we will see in time, but at least the international audience will now have a choice as to what story of Irish design to buy into. To quote Irish playwright Samuel Beckett, 'habit is a great deadener'. Let's find our way out of the habit of rurality and use exhibitions to bring to life to Irish design in ways that are fresh, honest and varied. Read back on Parts #1 and #2 of this series on design, exhibitions and Irish identity. The ID2015 programme continues across Ireland and around the world. Great further reading on Irish design includes Ireland, Design and Visual Culture: Negotiating Modernity 1922-1992 and Kilkenny Design: 21 Years of Design in Ireland. Deirdre Campion's thesis, Manifestations of a Nation, Ireland: Exhibitions and Symbols 1850-1950, is available to read in the the V&A's National Art Library.